Your time to shine has arrive, Pipette Enthusiasts! Pipette.com has announced their Pipette Art Twitter Contest. The contest has 3 grand prizes, with the Ultimate Pipette.com Prize Package consisting of a brand new pipette, 10% off calibration service, pipette-themed shirts and more. For those constantly borrowing the next door lab’s pipette or repeatedly using a loaner pipette, Pipette.com Twitter Contest is a dream come true. The Pipette Art Twitter Contest asks participants to follow Pipette.com on Twitter and submit pictures of anything they consider #PipetteArt. Submissions examples include (but not limited to) an assortment of pipette tips, color coordinated tubes, an abandoned drawer of pipettes, or creative drawing of their lab. The contest does not limit the participant to a picture of a pipette, but it can be anything related to pipetting. It is strongly advised that the Terms and Conditions be read before participants submit their #PipetteArt in order to familiarize themselves with the rules. 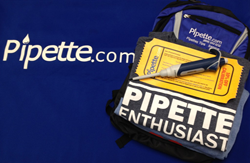 Pipette.com’s Pipette Art Twitter Contest prizes include a free Accupet Evolution manual pipette, a Pipette.com backpack, ‘I Heart Pie-Pet’ & ‘Pipette Enthusiast’ shirts, and discounted pipette calibration service. The contest runs from May 10, 2014 to June 30, 2014. Pipette.com is a market leader in liquid handling product distribution. Their comprehensive portfolio includes over 20 major brands of pipettes including Eppendorf®, Drummond® ThermoFisher®, BrandTech®, Sartorius Biohit®, Labnet®, and CAPP®, 10+ brands of tips, lab equipment, and ISO 17025 calibration service. 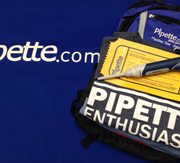 To learn more about Pipette.com’s Pipette Art Twitter Contest and how to win the Ultimate Pipette.com Prize Package, visit https://solutions.pipette.com/pipetteart-twitter-contest/.